Updated schematics for the project were placed online in May 2018. Changes in the May 2018 schematics were very minimal compared to the May 2017 schematics. Unfortunately, the May 2018 schematics included no changes at any of the locations of my items of concern. However, a project representative informed me that adjustments to the design including some of these concerns are still possible in a future re-evaluation of the ROD (Record of Decision). As of January 2019, it appears that the ROD is going to be delayed and is no longer expected in early 2019. A re-evaluation would occur after the initial ROD is received but before construction begins. Depending on the section of the project, a re-evaluation could be soon after receipt of the ROD or years in the future. Of course, I would be pleased to see some adjustments at any of the locations of concern before the project proceeds to construction. And I realize that changes in many or most locations may not be warranted, technically feasible or cost effective. Still, even with my remaining concerns, the project provides huge benefits to the downtown Houston freeway complex, so I continue to support the project and encourage TxDOT to proceed to construction as soon as possible. The connection ramp between the SH 288 toll lanes and Chenvert Street has been eliminated. The existing freeway has connections between the SH 288 main lanes and Chenevert, so the Chenevert connection was not a new feature. In the May 2018 schematic, the northbound SH 288 toll lane terminates into the connector to IH 45, and the entrance into the southbound toll lane is from the southbound frontage road. The design of the downtown connector has been altered at West Dallas Street. In the May 2017 schematic the downtown connector went over West Dallas. In the May 2018 design the downtown connector goes below grade underneath West Dallas. This change necessitated the elimination of the smooth transition from the northbound connector frontage road to Houston Avenue; northbound frontage road traffic must now make a left turn on West Dallas, cross over the connector main lanes, and the make a right turn on the road which becomes Houston Avenue. On the east side of downtown adjacent to the convention center, the exit from southbound IH 69 to Bell Street now has two lanes. 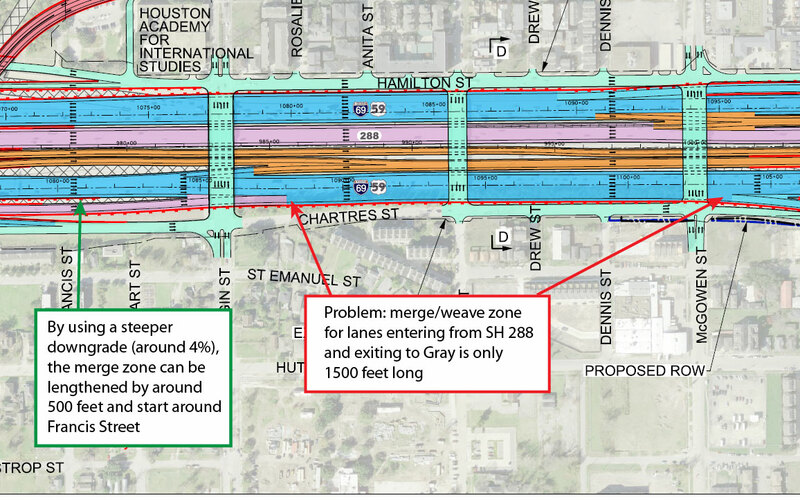 (Added 20-January-2019) Victor H Giron prepared this highly detailed techical analysis with suggested improvements north of downtown for submission to TxDOT, and shared it with HoustonFreeways.com. Victor's suggestions would correct all the issues I have identified and many more that he has identified. Many suggested changes are probably too extensive to be implemented at this point, but some can still be done with minor adjustments to the plan. Let's hope we'll see some of his suggested changes in the final design before construction starts. Any design adjustments relating to these concerns would be in a future re-evaluation of the Record of Decision. The existing exit to Fannin is eliminated and replaced with an exit to Almeda Road. This will force vehicles through six traffic signals to reach Fannin using a route with two turns. Using Wheeler to reach Fannin will exacerbate congestion in the area, and Wheeler does not have a left-turn lane to southbound Fannin. Proceeding to the west from the Almeda exit using routes other than Wheeler will be difficult and inconvenient since east-west streets are not equipped to handle through-traffic. With the currently existing exit to Fannin, traffic coming from SH 288 can exit to Fannin. If the Fannin exit is eliminated, SH 288 traffic will need to take a much longer route on surface streets to get to the west side of Midtown. The option shown in the diagram provides 400 feet to bring the ramp up to ground level. This is a 5% grade, which should be acceptable for an off-ramp where traffic must slow down. The benefits of this exit can justify a design exception, if an exception is needed. The design lacking the Fannin exit remained unchanged in the May 2018 schematic. Since an exit would probably violate design standards for upgrade, I'm thinking that restoration of the exit is unlikely. This design issue was introduced in the May 2016 schematics and was carried forward with no changes in the May 2017 and May 2018 schematics. The northbound entrance/exit to the MaX lanes is located at the exit for the connections to the North Loop. Traffic congestion usually occurs at interchange exit points. Now to further complicate this location, the MaX lane entrance is added at this spot. Vehicles positioning to enter the managed lanes will be weaving to the left, causing more lane-switching in an already congested area, likely worsening congestion. Both the northbound and southbound entrance/exit zones are very tight with no shoulders and minimal buffers. There is minimal space between the edge of the lane and pylon separators. (Pylons would likely have a short life.) It will be safer to have a shoulder and/or wider buffers, like the well-designed entrance/exit zones on the Katy Freeway managed lanes. Move the northbound managed lanes entrance/exit southward to be between Cottage Street and Patton Street (shown in the second diagram below), since properties are already being acquired and widening the right-of-way would have no additional impact. Or, a thin strip of right-of-way can be acquired on the west side, since only lower-tier commercial establishments would be affected. Also add buffer space and/or a shoulder along the managed lanes entrance/exit. Or, remove the northbound slip ramp entirely and replace with direct connections, as suggested in item 3 below. For the southbound entrance/exit zone, widen the bridge to provide a wider buffer and/or shoulder to improve safety and driver comfort. Possibly move the entrance/exit zone north to be farther away from the merge point of the connections from Loop 610. I was expecting to see some improvement to this situation in the May 2017 update, but nothing changed. And then the design remained unchanged in the May 2018 schematic. I still think this concern can be corrected with little or no additional cost, so I'm hopeful this will be reconsidered in a future re-evaluation. This item has existed on all prior versions of the schematics. But I still believe there is a need for at least one additional northbound entrance inside the loop, and there are potentially feasible options to be considered. There is only ONE definite access point to the northbound managed lanes inside the loop, from Travis Street downtown. 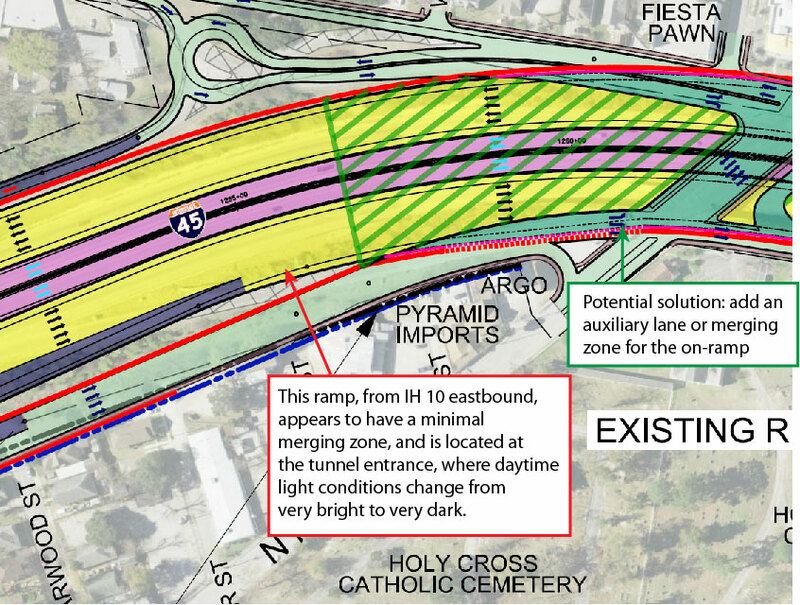 The May 2017 plan shows a potential connection from the IH 10 eastbound express lanes. Traffic on the northbound IH-45 main lanes, northbound on the downtown spur and westbound on IH-10 cannot get on the managed lanes until the entrance at the North Loop. Ideally, both the northbound downtown Spur and IH-45 northbound main lanes should have access to the managed lanes in the downtown area. It appears to be feasible to add access to the northbound managed lanes from both the IH 45 northbound main lanes and the northbound Spur. See the diagrams below. If both options above are not feasible or not cost-effective, shifting the northbound managed lanes access point to the area south of Patton as suggested in item 2 would help mitigate this problem, and may in fact be the best solution since it would also solve design concern #2. The plan also lacks a connection from the southbound managed Lanes to the southbound downtown Spur. I feel that connection is less urgent because main lane backups are more likely in the northbound direction. The May 2017 schematics did not provide any improvement for this situation while making many other changes in this area of the project. The May 2018 schematics included no changes in this area of the project. 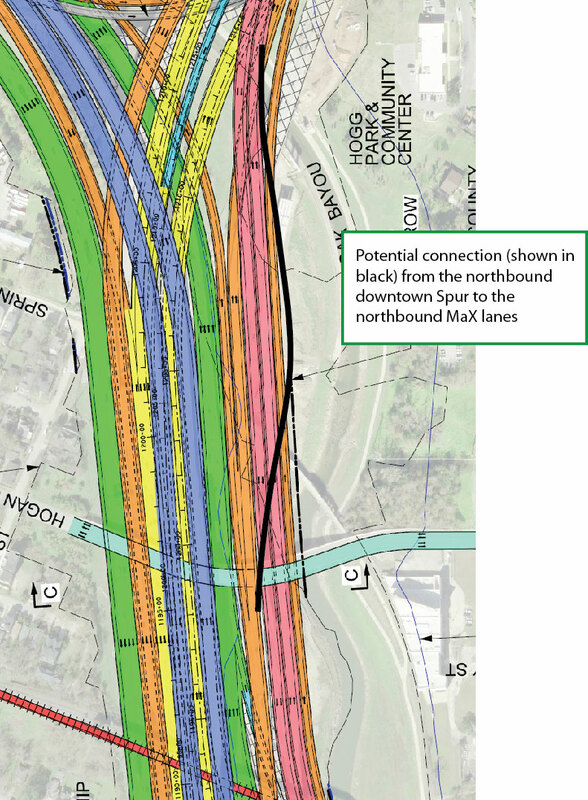 Since the additional connections (such as the ramps I am suggesting) will be expensive, I'm thinking that changes to address this concern are unlikely. 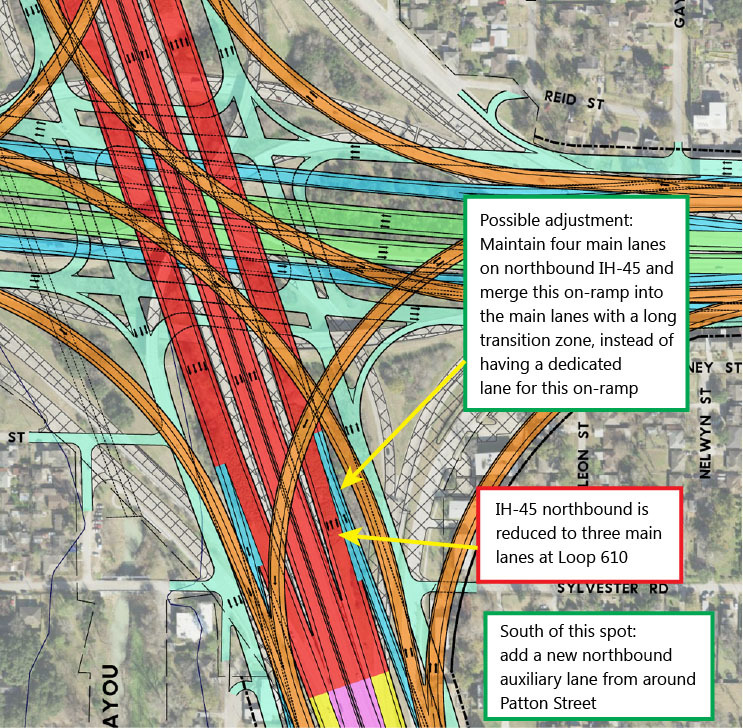 This image shows how a connection from the northbound IH 45 main laness to the northbound MaX lanes can be added. Due to constricted right-of-way width in this section, the design standards are compromised. Because the west side of the freeway is lined with lower-tier commercial establishments and some vacant lots, it makes no sense to constrict the width and introduce design compromises. It is unclear from the schematics if there is an adequate merging zone for the northbound entrance ramp just south of Main Street. Ideally an auxiliary lane should be maintained for a distance, possibly all the way to the Loop 610 exit. The merging distance for the southbound entrance ramp from Cavalcade also appears to be very short. Ideally, the right-of-way width should be widened to provide standard-width shoulders for both the main lanes and the MaX lanes. Add a northbound auxiliary lane for at least a short distance for the northbound entrance ramp just south of Main Street, and a southbound auxiliary lane for at least a short distance for the southbound on-ramp from Cavalcade. Consider using extra right-of-way on the west side which is currently listed as a potential detention area. Replacement detention acreage can be obtained around the truck stop. This is similar to the present-day situation, where the merging transition zone is too short. Extend the transition zone by adding a westbound auxiliary lane over Main and Yale. The May 2018 schematic was unchanged from the May 2017 schematic. This could potentially be considered in a re-evaluation, but my suggestion will extend the project scope westward along Loop 610, which may be a nonstarter. The merge zone into the northbound IH 45 main lanes is at the tunnel entrance, and changing lighting conditions may cause additional motorist distraction and stress, potentially making this a dangerous on-ramp if there is not a dedicated auxiliary lane. The May 2018 schematic was unchanged from the May 2017 schematic. 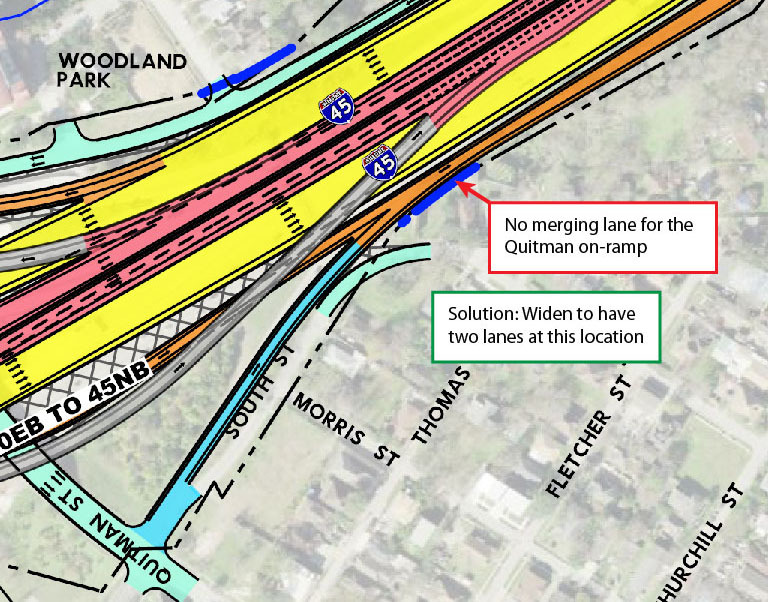 The concern about the merge zone with the on-ramp from Quitman should be easy to fix at minimal cost, so I'm still hopeful. Extending the merging zone with the main lanes may be technically infeasible, but I'm still concerned about a short merge zone right at the tunnel entrance. I previously raised this issue in 2016 and the May 2017 update did not improve this situation. The May 2018 schematic was unchanged from the May 2017 schematic. I still think this is a serious design concern which will cause backups on the ramp from BW8. While fixing this issue will have a non-trivial cost, it is probably the most cost-effective and feasible fix of all the issues in my list. I experience an excessively short frontage road merging zone on a daily basis on the Southwest Freeway southbound exit ramp to Beechnut, which has a lane weave zone only 1000 feet long, not nearly long enough and usually a stressful merge. 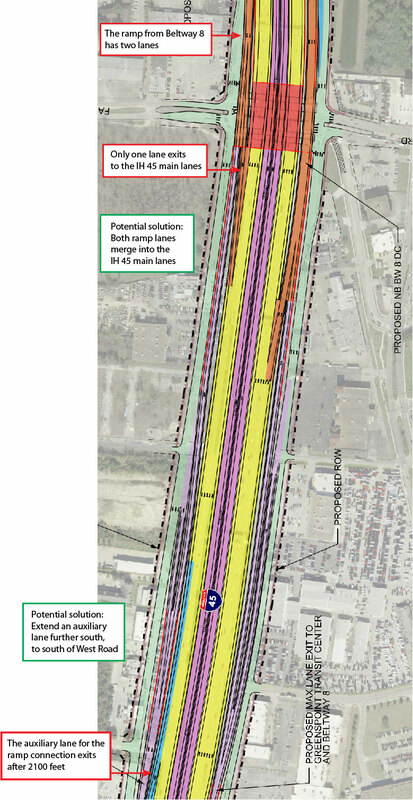 Two frontage road transition zones planned for Interstate 45 are less than 1000 feet. The southbound ramp north of West Road may need major rearrangement in conjunction with a fix for the issue with the lanes from the Beltway 8 ramp. 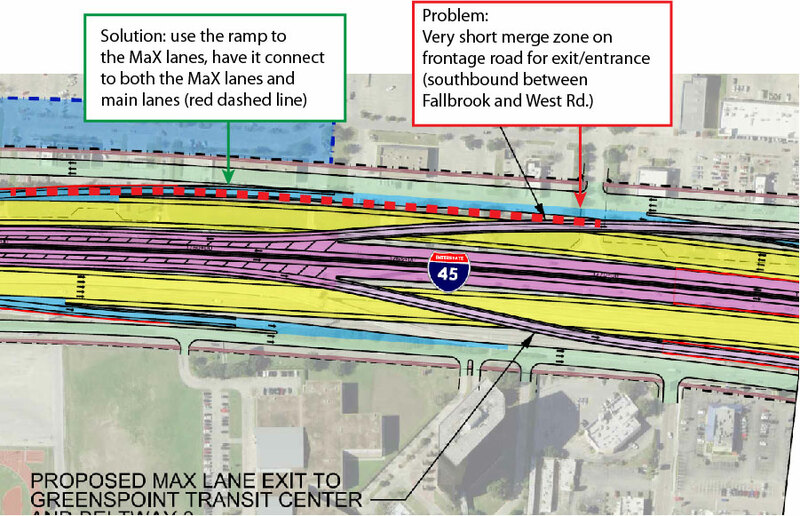 I'm thinking that the on-ramp should be included in the ramp to the MaX lanes, but then the currently-planned ramp will have a split point where traffic chooses between the MaX lanes and the main lanes (see diagram). In 2018 there were no changes to project north of Loop 610, and TxDOT did not post a revised schematic. These concerns are minor issues and may not warrant costly braided ramps, so I'm not expecting changes at these locations. Entrance ramps without a dedicated lane (and associated long merge zone) can cause traffic slow-downs and are a higher risk for accidents. That's why the existing freeway between Shepherd and Beltway 8 was restriped (with the interior shoulder eliminated) a few years ago to provide a dedicated lane for each on-ramp. The lane the on-ramp merges into exits in about 1700 feet, forcing motorists to make a second lane switch/merge after the initial merge. 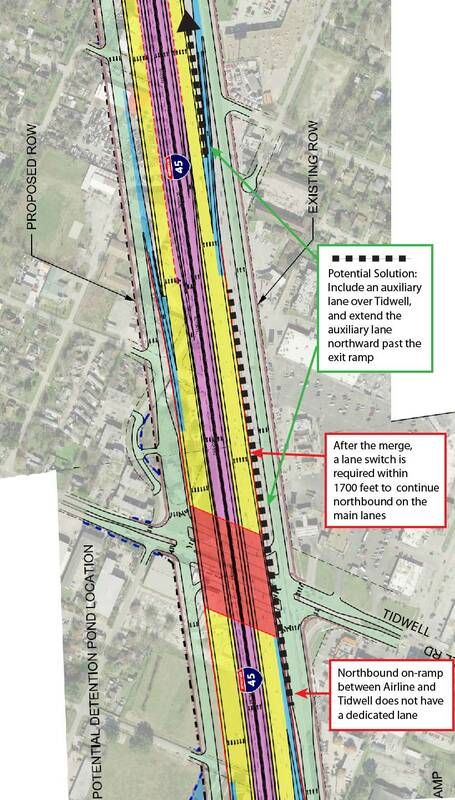 Include a dedicated lane for the on-ramp, which would add one lane to the freeway going over Tidwell. Ideally the fifth main lane will continue further north, perhaps to Shepherd, but it can also be merged into the main lanes after about 2000 feet before the next on-ramp. In 2018 there were no changes to project north of Loop 610. 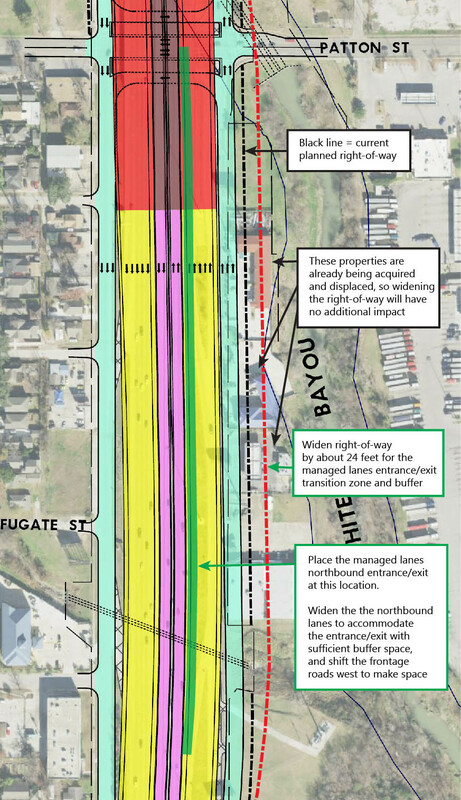 There appears to be sufficient space available for the extra lane at the Tidwell overpass, and there is definitely space available north of Tidwell, so adjustments in this area should be feasible. Southbound IH 69 traffic connecting to southbound IH 45 must move three lanes to the left in 2200 feet. Traffic coming from the ramp on the left side will also be moving to the right, causing a weaving zone. This will be in the tunnel just after entering the tunnel, and people's vision will be adjusting during the day, probably causing some delay in response time, making the connection more stressful for motorists. In my experience, viewing signage and changing lanes in a tunnel is more difficult than outside of a tunnel, which is another reason to move this connection outside of the tunnel. Move the connection northward (see diagram). 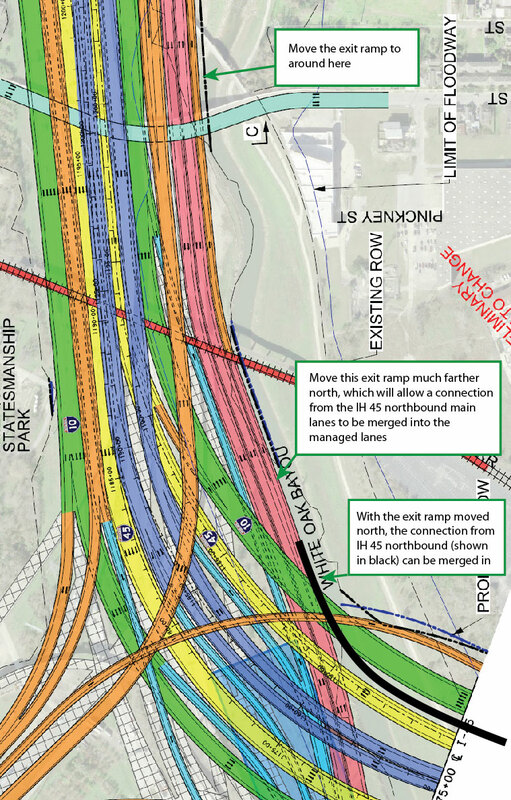 Ideally an auxiliary lane should be maintained on IH 45 southbound, but if an auxiliary lane won't fit, I still think it will be better for motorists to move the connection north. The existing connection should be maintained to serve traffic coming from IH 10 which needs to connect to IH 45 southbound. I still don't like the idea of having a weaving zone inside the tunnel, and I felt this was an easy issue to fix. The May 2018 schematic was unchanged from the May 2017 schematic. This is a difficult area for design due to the limited right-of-way, so I'm thinking that future changes are unlikely. Vehicles connecting from IH 45 northbound to IH 69 southbound may try to exit to Almeda, making a five-lane weave to the right in 1900 feet. Traffic entering the freeway from the Webster Street on-ramp will be moving to the left, creating a weave zone. The best solution is to minimize the number of vehicles attempting to exit to Almeda. Restoring the exit ramp to Fannin will provide another option for vehicles looking to reach the Midtown area. Without the Fannin exit, it will be 2.3 miles to the next exit at Shepherd, and this long distance will surely cause vehicles from IH 45 to try to reach the Almeda exit. This was another reason to restore the exit to Fannin. 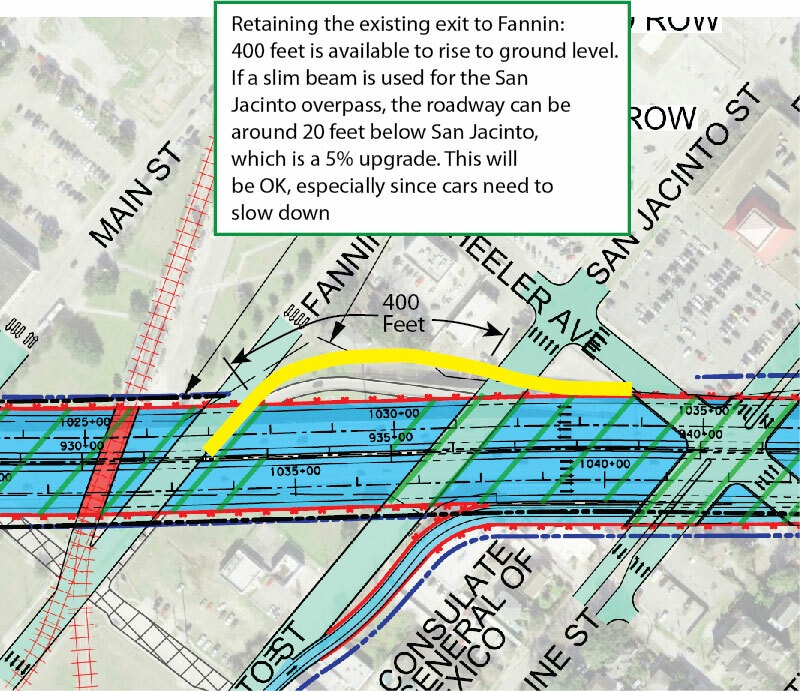 But since the May 2018 schematic was unchanged from the May 2017 schematic, it is assumed that the restoration of the exit at Fannin is unlikely. Move the merge point as far south as possible, possibly by using slim beams on the Alabama overpass and also possibly by a design exception of downgrade percent. A steeper than usual downgrade is preferable to a short and dangerous merging zone. The westbound Woodall Rodgers Freeway in Dallas has an 8% downgrade for a similar drop, with no negative effect. By using a 4% downgrade after the Alabama overpass, the connection ramp can be dropped 45 feet in about 1100 feet, which would increase the weave zone length by 500 feet. The May 2018 schematic was unchanged from the May 2017 schematic. My concern at this location may not be warranted by technical standards, and is more of a "nice-to-have". So I'm not expecting future changes relating to this concern. There is normally traffic congestion south of Loop 610 due to this bottleneck location. The managed lanes will help with this problem, but the managed lanes have poor access in the current plan (see item 3 above). The May 2018 schematic was unchanged from the May 2017 schematic. This location is more affected by issue 3, so I'm hopeful that future adjustments relating to issue 3 may also help with this item. The current IH-45 between Loop 610 and Beltway 8 has four regular lanes each way. The proposed facility also has four regular lanes each way, although there are many more auxiliary lanes, especially north of Loop 610. For an expenditure of probably around $2 billion for this section, you would think the project would include at least one additional sustained lane in each direction. We just need to look at the Katy Freeway to see that 5 regular lanes and 2 managed lanes are not sufficient at peak periods. Sure, there may not as much demand in the IH 45 corridor, but I still think that there should have been 5 sustained regular lanes in each direction, or at the very minimum, longer sections with 5 lanes each way. 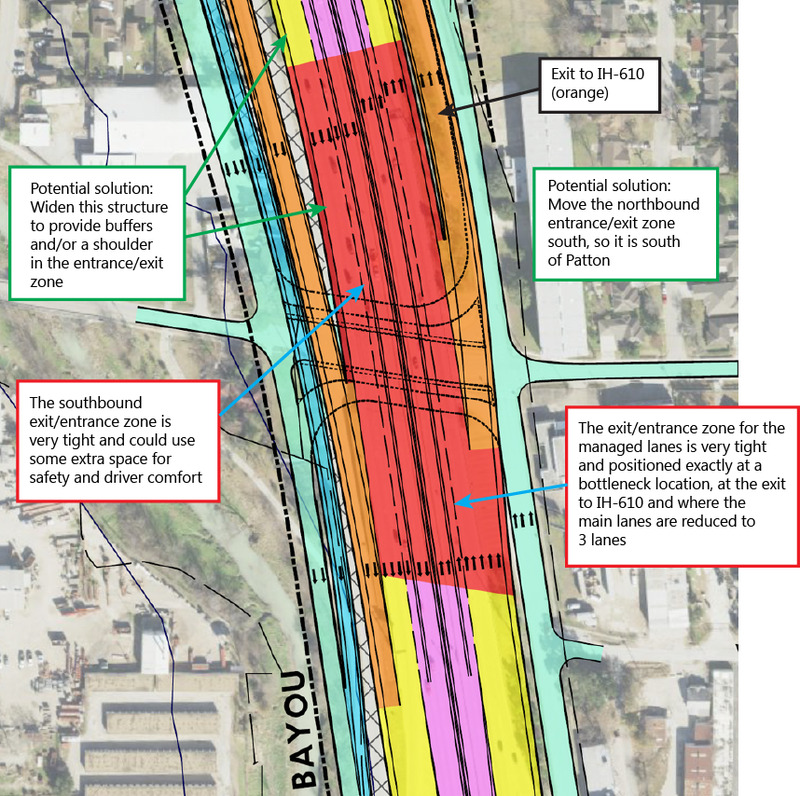 The currently existing on-ramp connects into the elevated lanes, and in the planned future design the elevated lanes will serve as the connection ramp from northbound IH 69 and SH 288, so it will have more traffic. The plan includes an off-ramp at the location where the on-ramp currently exists, so an on-ramp won't fit at this location. This is probably not a major issue. I'm thinking/hoping that TxDOT/HNTB's analysis shows that the single entrance point on Jefferson Street is sufficient. Also, traffic on Pierce looking to get on IH 45 southbound can continue on the frontage road to the entrance at Scott Street.